And the decompiler drama continues. This time with a GM Obfuscator, which obviously obfuscates Game Maker files. Keep in mind that this doesn’t prevent decompilation. But anybody who will decompile your game will have a hard time making sense out of it. Jetson :Stop whining about people “stealing” your code and make your games open source, it’s good for everyone. I am with you completely! only 1 prob. those people will always exist. Stop whining about people “stealing” your code and make your games open source, it’s good for everyone. Looks like his MPD strikes again: it’s now “Hardcoregamer”, not “Nateistoraw”! Nate, for real what in the world are you talking about, you make so many random post that don’t make sense (ex: Game Maker Blog, and the Gamemaker TV Forums). Also, whats up with you posting as different people? First your Hardcoregamer then you post as Nateistoraw. Do you have some kind of MPD (Multiple personality disorder )? What kind of medication was your mother taking, when she was carrying you? lol I dont have one. I only have screenshots. Noone can have a copy of mine, sorry. I don’t like anyone who is supporting the decompiler, but this is probably one of the first real steps into protecting games. This tool is a lot more useful than all those promises from YoYo Games: YoYo doesn’t do anything to protect against decompilation. Nate, what the hell are you talking about? Anyway I’m glad to see that the GMDecompiler website has been shutdown, so the only way to get the program (that i know of) is to beg someone that has it. This can surely not be anything but good, it will certainly prevent a lot of people from getting many things from games. It’s biggest downside is that it’s only for GM6, so it won’t actually affect the majority. I also dislike the maker saying he has respect for the person that made the decompiler. But the author should be proud, it’ll be very useful. Nate are you mental incapable of making a logical statement? This helps when someone DOES decompile your game (using the GM Decompiler) that the code is very hard to understand. Why don’t you read you read before posting, can you read at all? This article clearly says, “Keep in mind that this doesn’t prevent decompilation. But anybody who will decompile your game will have a hard time making sense out of it.” So let me inform you Nate, this is NOT a decompiler. It simply makes your code hard to understand if someone does decompile your game. that is the old version. The real one is called the gm decompiler it goes from dat or exe to gm5,gm6, and gm7. I’m in support of this project, I think Shreib did a hell of a job. 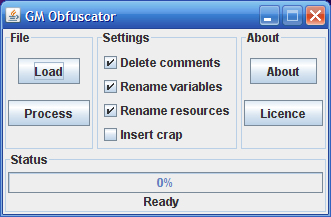 I’d like to see the obfuscator embraced, supported and expanded. Perhaps, in the future it can then include gm7’s GMK support.